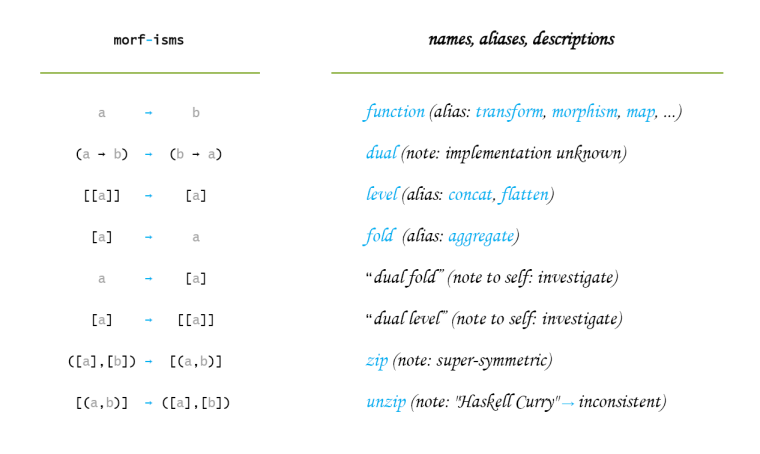 As part of my continued pursuit of the Lambda Lecture Series (my name for it) on Channel 9, I’ve summoned up a brain-storm worth of examples that show the symmetry and dualism of some functions and types. I’m not yet familiar with the higher-level abstract concepts of Arrows so arrow here simply means function. This entry was posted in Computer Science, Declarative, Paradigm, Software, Technical and tagged Arrows, Brainstorm, Channel 9, DOCX, Duals, Erik Meijer, Function, Lambda, Lecture Notes, LinkedIN, Map, PDF, Types. Bookmark the permalink.